It's a terrible scenario. You get into an accident where it's not your fault and suffer a broken leg. Due to the injury, you are in the hospital for an overnight stay and must have a surgery and subsequent rehabilitation to get back to form. You will also lose wages due to missed time at work. You make a claim only to find out that the person who hit you does not have bodily injury liability insurance. You are left with all of the costs. This is not a rare scenario. There are millions of drivers out there who do not have bodily injury liability insurance. You never want to think about getting into an accident, but you do want to be prepared if it happens. The best way to protect you and your family is to have the maximum coverage. You shouldn't take the chance that the person who hits you isn't one of the millions without this type of liability insurance. Ask anyone who has faced this scenario. It simply isn't worth it. 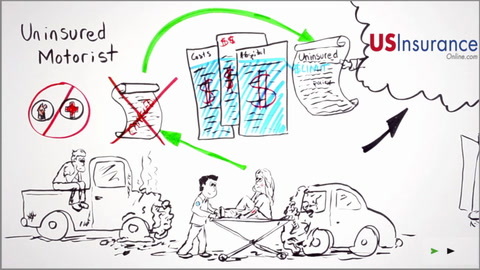 If you have any questions about uninsured motorist property damage coverage, this video should help, and as always, you can always contact an insurance representative to learn more. Drive worry-free with uninsured motorist property damage coverage.